Update - Silikids silicone-wrapped glass now here! Update – Silikids silicone-wrapped glass now here! Australian kids no longer have to drink out of plastic cups or risk breakages and injury – Silikids’ silicone-wrapped glasses are finally here! We first told you about these in August last year and this is one release which has taken its time arriving. Now you can finally give glassware to your children without worrying about any of the risks that come with using a conventional glass. Silicone is an awesomely versatile product. It insulates and protects little fingers from heat or cold and cushions otherwise breakable glass, turning it into a safe option for serving drinks. 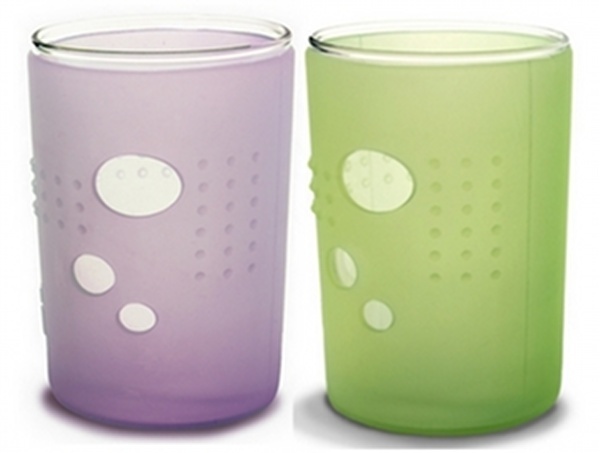 Available in attractive aqua, purple and lime, and with grippy holes for little fingers, the Silikids Glass is wonderful for kids able to handle cups. The silicone is 100 per cent BPA-free and can be washed in the dishwasher. We’ve featured Silikids here before when we wrote about their bibs and knee pads. Buy Silikids glasses from Baby Grow Safe for $38.95 for a four pack, $24.99 for a twin pack, or $12.99 for a single glass with silicone sleeve.